Anyway, I've been walking a lot in the area in the 30's, 20's and Teens lately between Park and 6th and think that it's one of the most magnificent areas of NYC. There are so many extraordinary old buildings with such lavish detail. Amidst them, however, there are some pockets of junk which detract from the area. One example of the junk is the stretch on B'Way from the low 30's to about 25th Street which has some really run-down one and two story buildings and REALLY shady people. Nevertheless, there are some truly magnificent structures there. This area would be so prime for new residential and hotel development, especially because it's between 5th and 6th, which have a lot of development. Also, because the existing buildings are tiny, they could be demolished with ease. What are your thoughts on this area? Does anyone know of any new projects? Funny you should say; I was just exploring around there yesterday. Broadway between Union and Herald Squares has some gorgeous Second Empire cast iron buildings that look like they were built for small department stores...except the part south of Madison Sq. is upscale, the part north definitely isn't. But, walking down the whole stretch, I sensed some kind of architectural continuity. I know nothing about the history of the area but it seems like it was probably some extension of Ladies' Mile. They should try to restore that. A quick jaunt over to 6th Avenue revealed some new-ish luxury apartment towers and a hell of a lot of vacant lots. There was a sense of quiet desolation. I think the whole of Sixth Avenue could use some sprucing up. Every weekday, when the weather permits, Madison Square Park fills with office workers on their lunch breaks. Some sit on benches and eat sandwiches from nearby delis. Others buy cheese fries and Chicago Dogs at the Shake Shack, an outdoor restaurant that opened last year. But there's a relatively new addition to the area: children scrambling over a jungle gym at the playground built during the park's 2001 renovation. The neighborhood known as Flatiron or Madison Park is no longer just a 9-to-5 destination. Since the park's renovation, families and professionals have started moving in. While the first developments sprouted up four years ago, the neighborhood is just now starting to blossom. "The Flatiron district, I would say, is one of the hottest districts in all of Manhattan," a Dwelling Quest broker, Robert Rosa, said. Brokers say apartments in the area are selling for $1,200 a square foot, compared with $800 in Midtown. The prices are partly a function of supply and demand: The neighborhood simply doesn't have a lot of condos yet, Mr. Rosa said. The building at 50 Madison Ave., which was bought four years ago and converted into nine condos with more than 2,600 square feet each, is full. But other condo conversions around the park are in earlier stages of development. 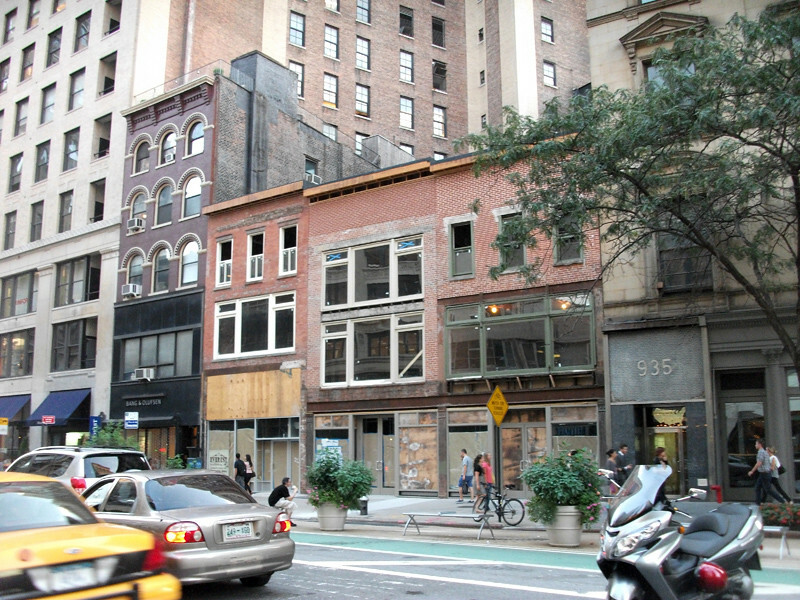 Just down the street at 225 Fifth Ave., Elad Properties is converting the Gift Building into 192 apartments. The 41-story MetLife building at 1 Madison Ave., which is actually two connected buildings totaling 1.4 million square feet, sold for $900 million earlier this year.The buyer, SL Green Realty, plans to convert at least part of it into residential space. Tenants of the International Toy Center, a 1 million-squarefoot convention center on the western side of the park, will have to move out when construction begins in early 2006. The building's destiny? Condominiums, of course. "It's become so much more of an inviting area for residents," Nick Athanail, a Corcoran vice president who lives on 25th Street, less than a block east of the park, said. "It's really flourishing in a way that Midtown is not because of the commercial element of Midtown." Location plays a major role in Flatiron's popularity. "It's close to everything," said Christine Wu, who paid $790,000 for a 650-square-foot apartment in Mr. Athanail's building last year. "You're close to downtown and you're also close to Midtown, where I work.There's a lot of trendy restaurants popping up, like Tabla. It's just really convenient." The exclusive broker for 50 Madison, Halstead Senior Vice President Louise Phillips Forbes, credits restaurateur Danny Meyer for reinvigorating the neighborhood before it was trendy. He opened both Tabla and Eleven Madison Park in 1998, and owns the Shake Shack as well. "He has been a great influence for Flatiron because he took a big risk investing in a project of that magnitude that may not have had an evening market," Mrs. Phillips Forbes said. "He's created that choice for Flatiron so you don't have to leave the neighborhood for fine dining." Every broker defines Flatiron differently. Depending on who is talking, the border can stretch east to Lexington Avenue, west to Sixth Avenue, as far south as Union Square, and as far north as 29th Street. Until recently, those blocks had been lumped with the neighborhoods bordering them: Midtown, Chelsea, Gramercy, and Union Square. Now, however, brokers are seeing Flatiron, which gets its name from the iconic triangle-shaped building on the southern side of the park, as an area in and of itself. "The Flatiron area used to be kind of linked with Gramercy," a JC DeNiro vice president, Hunie Kwon, said. "I'd say recently, with the renovation of Madison Square Park, it's kind of come into its own." The park-side developments anchor the neighborhood, but condos are popping up all around the area. The process accelerated with a zoning change last year, which allowed more residential development in the Ladies Mile Historic District, north of 16th Street and south of 22nd Street between Fifth and Sixth avenues. The president of the real estate firm Massey Knakal, John Ciraulo, said the zoning change doubled the value of property on that strip. "I know developers are just frothing at the mouth at the prospect of getting one of those buildings," said Matthew Haines, the founder and co-owner of Property Shark, a Web site that aggregates real estate data. He added, "In that area between Fifth and Sixth, there's definitely going to be an opportunity for mid-block development, where someone with a four-story building is going to add another six floors." Some developers need froth no longer because they have already taken advantage of the zoning change. A sales office recently opened for 4 W. 21st St., a building being developed by the Brodsky Organization. Another opened for the Altair Lofts, Extell's developments on 18th and 20th streets. The cost for those luxury condos: nearly $1,200 a square foot. Nice if they fixed that rooftop addition. Speaking of rooftops, does anyone know if the stunning building on B'Way that housed Bombay Company is getting its cornice restored? I read in an architecture book that its cornice was torn off years ago. It seems the lovely cornice was removed to accommodate a 5-storey addition . 900 (corner):This orangish structure is another (and better) Stanford White design, erected in 1886 on the site of the old Goelet mansion, the last such house on Broadway--a gloomy place haunted by peacocks. The top five floors of the present building are an ill-conceived addition. Was Bombay Co., Metropolitan Carpet Gallery; also houses craftbar, formerly the wine bar Morrells. When I was in NY last month, I saw netting/scaffolding covering the entire building so I was wondering if the cornice was being replaced. I hope so. Coney Island's favorite landlord Thor Equities bought some old Flatiron District buildings on Broadway a few years back, then wrapped them in promotional banners complete with illustrated fake facades and slogans like "Lease me now, love me forever!" The faux-cades were to hide the battered states of the old buildings, but they saw little action save for the occasional prank. 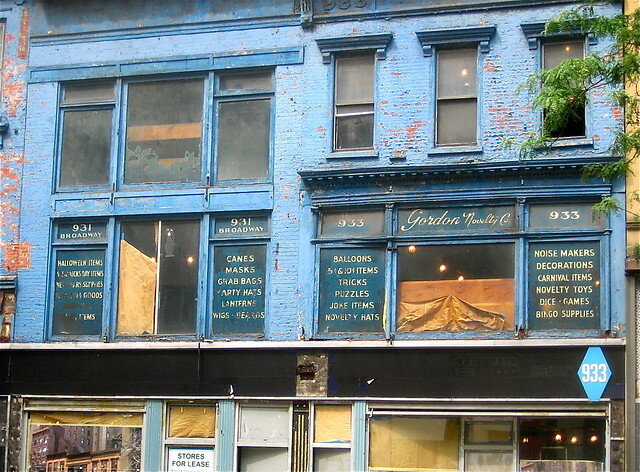 Now something is up, because Vanishing New York notes that the wrapping paper has come down, revealing what's left of the ancient Gordon Novelty Shop. We'll take wigs and novelty hats over brokerbabble any day. I remember when they put that up, I thought it was pretty stupid. Glad they've taken it down, though I am surprised they haven't had any bites. Some progress. At least they weren't knocked down. That's good. I always feared for those little gems. I hope that the roughly five-story, 1970s POS across the street that houses the furniture store is razed. ... there's still some prime space to be had, like this triangular parcel on West 30th between Broadway and Sixth Avenue, apparently on the market for $42.75 million. The lot currently contains a parking lot, four-story commercial building and one-story building with 122,600 buildable square feet, or around $348.69 per square foot. The location has certainly done well in the past: it was the site of the infamous Haymarket, one of 19th century New York's most notorious dance hall (read: brothel) in the Tenderloin district. Asking price for the same lot back in 1911? $1,000,000. I hope that tall of he beauties on this stretch of B'Way are preserved. Community Board 5 revisited the case of the hotel coming to 250 Fifth Avenue last night because 1) the plans had undergone a few changes based on Landmarks Preservation Commission suggestions, and 2) the board had forgotten to give notice to the neighborhood the last time the plans were presented, effectively denying Flatiron-dwellers their day in court a high school library. The changes turned out to be minimal—horizontal banding was added at every other floor because the LPC thought that the expression of the 23-story tower was too vertical, and the canopy was revised to give it more historical context. The issues brought up by community members were more interesting, however. The first set of issues brought up by community members involved the fact that the hotel tower would be set back 15 feet from the street face. 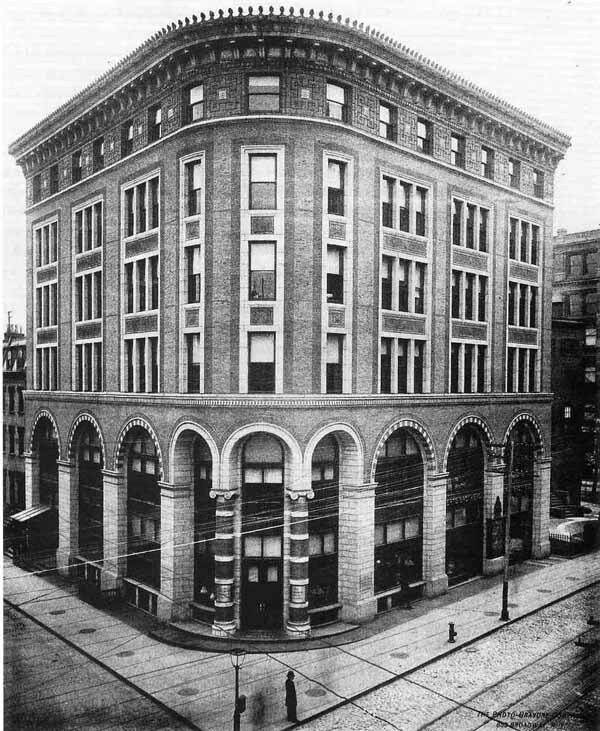 Three residents of 260 5th Avenue, a co-op building adjacent to the rear of the proposed hotel, were present and they brought a ringer: Doris Diether, once described by the Observer as the Grande Dame of New York City land use, who testified that in the entire Madison Square North Historic District there were zero buildings set back from the street wall. While Diether and the building residents maintained that they were invested in the architectural consistency of the neighborhood, the board seemed unconvinced that it wasn't just a ploy to gain additional backyard space. The developers, Quartz Associates LLC, were completely uninterested in revising their plans, which would require a City Planning Commission special permit, a 7-12 month delay, and additional cost. Things appeared to be livening up when a representative of the New York Taxi Workers Alliance, current tenants in 250 Fifth Avenue, took the floor and began grilling the developers directly about when the NYTWA would be kicked out and how much construction noise they would be forced to endure before that happened. (As it stands, the bank on the bottom two floors of the building would remain, but everything above that would be converted to hotel.) He was quickly silenced by the community board, however, which was only interested in hearing about landmarks issues. He concluded his remarks by stating, "New York needs another hotel like we need more bedbugs." The board was unswayed and voted 8-0 (with one abstention) in favor of the plans. 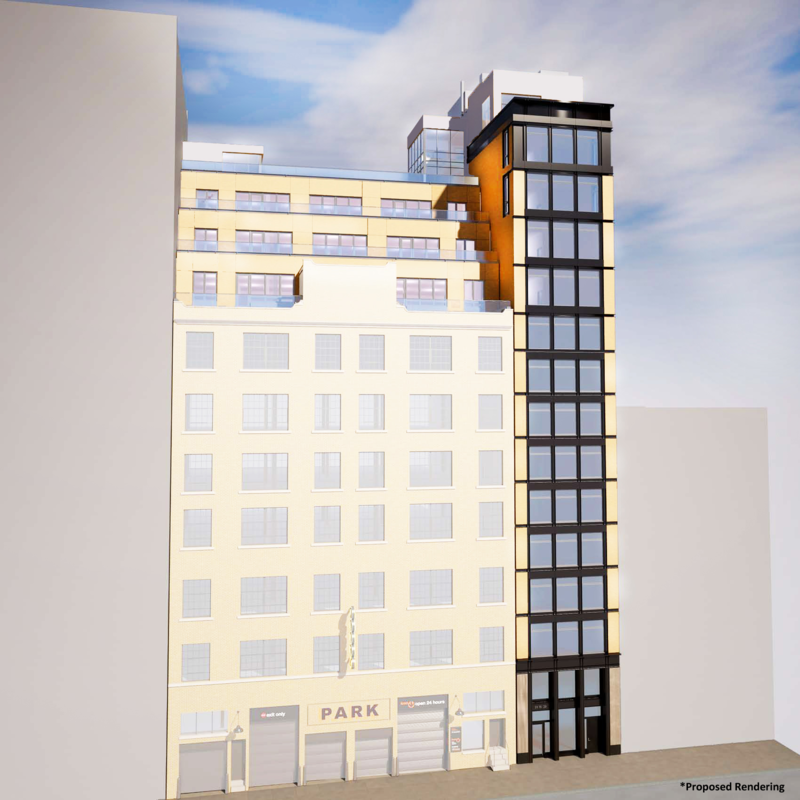 Gale International has closed on the purchase of a development site at 21 West 20th Street. The investment and development firm, which last fall agreed to purchase the property from Gary Barnett’s Extell Development, has also acquired air rights needed to move ahead with the construction of a 15-story luxury condominium tower at the site, The Real Deal has learned. Gale — best known for its role as the master plan developer of the $35 billion, 1,500-acre Songdo International Business District in South Korea — paid $9.75 million for the property, the company told The Real Deal today. Bob Knakal of Massey Knakal Realty Services brokered the deal, which was Gale’s first in Manhattan. The 15-story tower, scheduled for completion in 2014, is expected to consist of 12 units, including three 100-foot-wide penthouses with private outdoor spaces, a spokesperson for the developer said. All units will have direct elevator access. The architecture firm Beyer Blinder Belle has designed the building, which will have a glass, steel, and brick façade. “We intend to leverage the extensive experience gained in the global markets to deliver an unparalleled product in Manhattan,” said Stan Gale, chairman and managing partner of Gale International. The Gale family has long been a force in New York and Long Island real estate. When Stan Gale’s daughter, residential broker Katherine Gale, joined Long Island brokerage Daniel Gale Sotheby’s last year, she was the fourth generation in her family to work at the firm, which her great-grandfather founded in 1922.